Vendors and financial institutions tango to determine the most effective means of information exchange. Boston, July 31, 2014 – Vendor risk managers collect the cold, hard facts about the risks their firms' vendors represent. On the softer side, VRM also evaluates the level of vendor cooperation and the feel of vendor conversations to advance information sharing and contract negotiation. With an iterative process that involves evaluating hundreds or even thousands of new and existing vendors, how can VRM accomplish its mission among the onslaught of risk assessments and vendor oversight requirements? 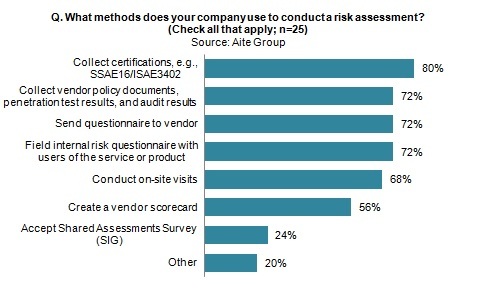 Based on a mid-January to mid-April 2014 online survey of 26 financial services firms located around the globe, this Aite Group Impact Report focuses on VRM's framework, operations, and technology. It is the second in a series of three reports on VRM—find the first here. This 33-page Impact Report contains 21 figures and one table. Clients of Aite Group's Insurance, Institutional Securities & Investments, Retail Banking & Payments, Wealth Management, or Wholesale Banking & Payments services can download this report.